It is with deep regret that I inform you of the sad death of Mrs Kathleen Emerson, Honorary Secretary of County Donegal Historical Society. Kathleen passed away on Monday 26th July 2004 and her funeral Mass took place on Wednesday 28th July in Saint Patrick's Church, Ballyshannon. Mrs Kathleen Emerson has given outstanding service to County Donegal Historical Society and has successfully filled the role of Secretary for 44 years. She was an outstanding administrator whose meticulous attention to the needs of members and to the needs of the Society, was appreciated by all who had the pleasure to come in contact with her. Her devotion to County Donegal Historical Society was shared by her husband, Lucius, a founder member, Trustee and Curator of the Society Museum at Rossnowlagh. Former Presidents, Executive members and members of the Society formed a guard of honour as a mark of respect to one of our most distinguished members, as her remains were brought to Historic Abbey Assaroe in Ballyshannon, to her final resting place. Fr. Cathal Ó Fearrai, P.P. Kilbarron Parish officiated at the graveside, assisted by Fr. Aodhán Cannon and Fr. Ambrose O'Gormon. We will always remember Kathleen as a lady of outstanding Christian principles, whose devotion to her family, her church and County Donegal Historical Society were exemplary. Our sympathy goes to her husband Lucius, her brothers Colm and James Toland (Limerick), Patrick (Bray) Daniel (Dublin), nephews, nieces, sisters-in law and extended family. Lucius Emerson was a very exceptional man; a man of many gifts and talents, who gave generously of his time and expertise, not only to County Donegal Historical Society but also to his students, the community of Ballyshannon and also to his adopted and beloved Donegal. A school principal, historian, curator, craftsman, writer, soldier, artist, hunter, lecturer, motivator and pioneer were but some of his amazing accomplishments. His home in Ballyshannon was shared with his wife Kathleen, until her death in 2004, and was an open house to visitors to the county, to members of County Donegal Historical Society and anyone in search of advice or guidance with educational or historical matters. Both Kathleen and Louis were most welcoming and attentive to all visitors; anyone who had the pleasure of calling with them will always treasure the memory of their hospitality and helpfulness. They were unpaid ambassadors for the county at large and it can never be estimated the information, hospitality and good will which they shared with countless visitors to the county. Louis was born in Monaghan town where his father was employed as a woodwork teacher, a career which Louis would later pursue. On the early death of his father the family moved to Portumna in Co. Galway where he was to receive his early education. His home in Portumna was adjacent to the Clanrickarde estate which always aroused great curiosity in the young Emerson with stories of landlords and evictions. It was also, secretly, on this estate that Louis was taught to trap and snare rabbits, wild geese, hares and wild duck. This love of hunting was to be a lifetime pursuit and many local people will recall Mr. Emerson, as he came to be called, fishing for seals at the Mall Quay or hunting through the field around Ballyshannon. Another youthful pursuit in Portumna was playing Hurling. Indeed Louis recalled the boys cutting ash trees to make their own hurleys and later on, when he came to Donegal, he was to show his students how to make hurleys. Louis attended St. Jarlath's College in Tuam where he played on hurling teams. Following his school days he served his time, as an apprentice to a building contractor, and later won a scholarship to the College of Art in Dublin. When he qualified as a woodwork teacher his first post was to be Ballyshannon in 1936. When Louis arrived in Ballyshannon in 1936 his worldly possessions were a bicycle, a suitcase and a hurley! He commenced teaching in the Technical School on the Mall, adjacent to the Assaroe Waterfall and close to the bridge of 14 arches which, sadly, were both demolished to make way for the Erne Hydro Electric Scheme in the 1940's. He worked alongside James O'Neill, Principal of the school, who was also Chief Executive of County Donegal Vocational Education Committee and who was one of the great pioneers of technical education in the country. He had a tremendous influence on the young Louis Emerson, newly arrived from Galway. In 1938 Louis was requested to go to Loughanure, in the Rosses, to start a school where he was able to innovate and design a curriculum to suit the needs of the students and their community. He initiated crafts such as hand loom weaving, the making of simple furniture and farm implements. "The Emergency" saw Louis moving to Stranorlar in 1940 to successfully set up a Vocational school there. Louis always recalled with great admiration, the great distances students in Loughanure and Stranorlar cycled to school and the great sacrifices parents made at the time. 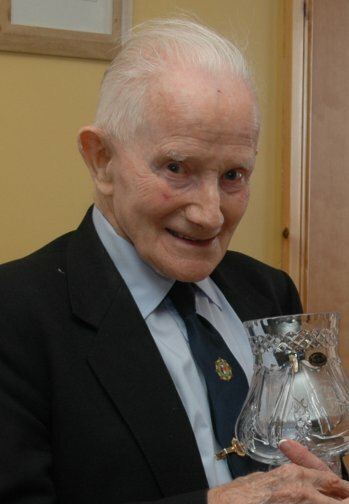 He was also to win a County Hurling title in 1947 with Erin's Hope, a Stranorlar-Ballybofey team which included the three Hannigan brothers, Jim, Paddy and Jack. In 1949 Louis was to return to Ballyshannon where he would remain for the rest of his teaching career. In 1952, as Principal of Ballyshannon Vocational School, he organised the opening of the new school in College Street, a continuation of his pioneering days in the county. Louis was a firm disciplinarian who had a tremendous interest in the welfare of his students and motivated them to reach their full potential. A great believer in the importance of extra-curricular activities he promoted Gaelic Football, Camogie, Boxing and gymnastics. He also pioneered adult education in this area and, in his early years, cycled to out centres to deliver courses in carpentry and joinery, furniture restoration, art, local history and any topic which communities required. Nothing pleased him more than to place one of his students in an apprenticeship or semi-state position, to see them advancing to third level or establishing their own business. He possessed a most keen memory and intellect up to the time of his death and could clearly recall students he had taught as far back as the 1930's. It was always fascinating to watch him, meeting former students and, not alone, establishing their identity but also recalling events from their schooldays and indeed recalling others who were in the same class! Members of the Historical Society can identify with his amazing memory as he was an avid reader with a tremendous interest in people and their stories. His father had been actively involved in the War of Independence and it is little wonder, that all through his life, Louis had a tremendous interest in military matters, be it, the campaigns of Red Hugh O'Donnell, The Spanish Armada or the 1916 Rising. He joined the Local Defence Force (L.D.F.) at the end of 1939 and when he was commissioned in 1946, he dedicated his spare time to training young men in military tactics and weaponry. He is regularly remembered by many who joined the L.D.F. and later the F.C.A. and, such was his commitment to the military life, some even felt that this was his day job! He was way ahead of his time in training young school students in Gymnastics and Figure Marching and many will recall the magnificent displays in Ballyshannon, in Bundoran, Grange and other venues. It was appropriate that a guard of honour from Finner Camp attended his funeral mass, as he had a tremendous bond with the military all through his life and enjoyed being frequently invited back to Finner Camp. The successful museum which County Donegal Historical Society currently has in the Franciscan Friary in Rossnowlagh had its origins in Stranorlar. Louis, who was curator of the museum until his death in 2005, described its origins in "A Golden Jubilee Story", a book compiled by Cecil King in 1995. "The idea of a local museum for County Donegal arose from the fact that the late Andrew Lowry very kindly presented for exhibition in the Vocational School, Stranorlar, a selection of his wonderful collection of archaeological and historical artefacts for exhibition during the Civic Week of Easter 1946. Today we still cherish the artefacts he donated to form the nucleus of a collection for a local museum. This consists of stone ores, flint arrowheads, scrapers and flint cutters. Included in this collection were spindle whorls, stone querns, bullawns, a Penal day chalice, and a 1798 pike head from the Finn Valley. Up to 1949 the items were housed in the Vocational school, Stranorlar, but on being transferred to Ballyshannon School I brought the collection which had started to enlarge, to that school. In the following five years storage and display became a problem but in 1954 the late Fr. Terence O Donnell, O.F.M. came to the rescue and very kindly offered a room to form a museum in the Franciscan Friary in Rossnowlagh. This became known as the County Donegal Historical Society Museum and was officially opened in 1954 by the Minister for External Affairs, the late Frank Aitken. Due to the enthusiasm of members both at home and abroad who have contributed many articles of great archaeological interest, the Museum has now grown to over 500 archaeological and historical objects." The Museum in Rossnowlagh will always stand as a monument to Louis Emerson because, single-handed, he collected all the artefacts and memorabilia which people entrusted to his care and they can be assured, that the loving care which he showed will continue as a mark of respect to his memory. Both Kathleen and Louis had a wonderful regard for the Franciscan Community in Rossnowlagh, for the Franciscan's generosity in providing a home for the Museum and it is our desire that this bond will continue. Louis celebrated the Golden Jubilee of the Museum in 2004 which was also, sadly to be the year of Kathleen's death after 44 years dedicated service as Secretary of the Society. A founder member of the Historical Society in 1946, Louis was recognised as the foremost authority on the history of the county and was the father of the Society. To those of us in the Historical Society, he was a tremendous inspiration; always encouraging, always interested in our researches and a font of knowledge which he willingly shared. In 1960 Louis married Kathleen Toland and thus began one of the greatest partnerships in Irish local history. 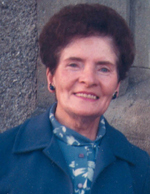 Kathleen became Secretary of the Society in 1960 remaining in office until her death in 2004. Together they worked tirelessly to develop the society and make it one of the largest in Ireland. Dr. Lochlainn Mc Gill in his Golden Jubilee(1996) article, "Memorable Events of the last Fifty years" writes of the Emerson's contribution to the Society; "The Historical Society continued to go from strength to strength, much of the impetus contributed by the steady stewardship of our esteemed secretary Kathleen Emerson and her husband Lucius. Her total commitment to the Society and her outstanding ability as an overall organiser has been the most productive highlight of the last twenty five years of the Society." This unique partnership gave an excellent service to our members at home and abroad, who got a prompt handwritten reply to their queries, valuable assistance when they telephoned and a hospitable welcome when they called at their home Mr. Emerson was a researcher, prolific writer, lecturer, broadcaster and storyteller. A lecture or field day under his direction was a joy to behold as you realised that you were in the company of a master. When Louis took off his glasses, "to digress" as he used to say, you knew you were going to be enthralled by anecdotes, stories and a sense of humour which could be detected in his twinkling eyes. Louis Emerson's exceptional scholarship and learning, was recognised nationally when in June 2005 he became the very first person in the country to be awarded an MA degree in recognition of his lifetime research and scholarship. At the award ceremony in the Higher Education and Training Awards headquarters in Dublin, Mr. Seamus Puirséill, Chief Executive of HETAC, lauded what he called; "the remarkable academic and scholarly achievements of Mr. Emerson. Only France has a similar framework to recognise such outstanding achievement in learning and scholarship outside the confines of a third level institution and I am very pleased that Lucius is the first recipient of an MA degree having undergone a very rigorous assessment and validation process by HETAC. It should be noted that the manner in which this degree was awarded is exceptional. It is based on the decades of study and practical learning undertaken by Louis." What a fitting tribute to a man who dedicated his life, to County Donegal Historical Society, Vocational Education, to historical research and to lifelong learning. I had the honour of sharing with Louis his last field day for County Donegal Historical Society, in July 2005, when he welcomed the O'Donnell clan to Rossnowlagh and I later welcomed them to Ballyshannon. He was determined to welcome the Spanish O'Donnell's, in their native tongue, and wrote his speech of welcome in English and Ms. Lisa Lawrence translated it into Spanish for him. The thoroughness and professional approach which he showed, at 93 years of age, was just incredible; as he learned to pronounce the Spanish words, listened to a Spanish tape and had a "Teach yourself Spanish" book beside his chair. Days before the event, in true Louis style, he decided to have a photocopy for each of the Spanish visitors lest they might have any trouble with his pronunciation! Louis delivered his talk in Spanish in the presence of the President of County Donegal Historical Society, Vincent O'Donnell, who had co-ordinated this clan rally. This is the Louis Emerson we will remember: a visionary, a pragmatist, a generous man, a man undeterred by obstacles, prepared, determined and focused. Members of County Donegal Historical Society, former colleagues at Ballyshannon Vocational School and members of the Irish Army formed guards of honour at his removal and funeral mass which was celebrated by Fr. Aodhán Cannon, outgoing Editor of the "Donegal Annual." Louis was interred alongside his wife Kathleen in historic Abbey Assaroe graveyard.